The convenient Merlin Garage Remote Access Pack controls up to three Merlin Security+ 2.0 garage door openers. The Pack consists of one E945M keyring remote and one one E943M three-button visor remote. The remote controls are easy to program and attach easily to a keyring or car visor. 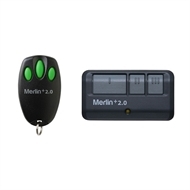 Compatible with all Merlin Security+ 2.0 Garage Door Openers.